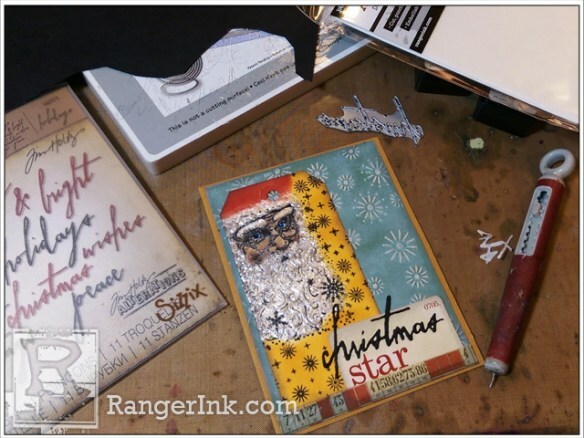 Tim Holtz Alterations by Sizzix: Vagabond Machine and Magnetic Cutting Platform; Texture Fade: Sparkles; Thinlits Die Set: Handwritten Holidays. 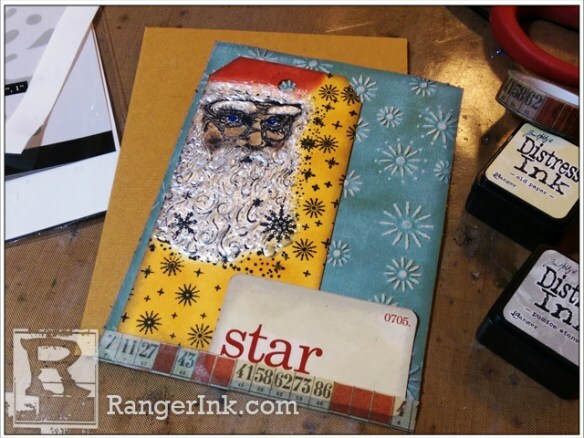 Anita made the most of an assorted paper pack by making the same card in different color combinations. 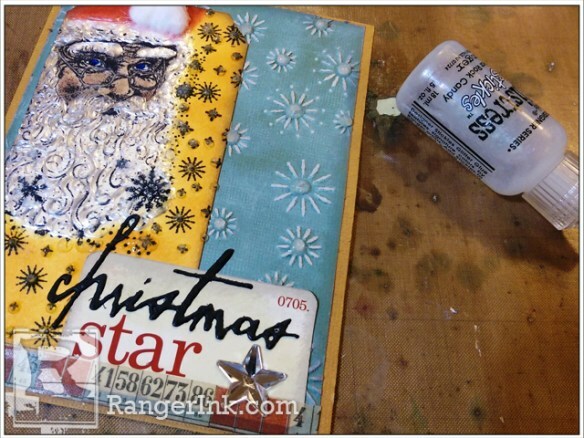 Step 1: Stamp Santa face in upper left part of #5 Manila Tag with Jet Black Archival. Stamp the sparkly snowflakes around the face in Jet Black as well. Step 2: Ink in the red hat portion of the Santa with Fired Brick Distress Ink using a Mini Ink Tool. Ink over the rest of the tag with a color that matches the card base you will use (There are 10 colors to choose from in the Core’dinations A2 set, and you can make as many as you want.). 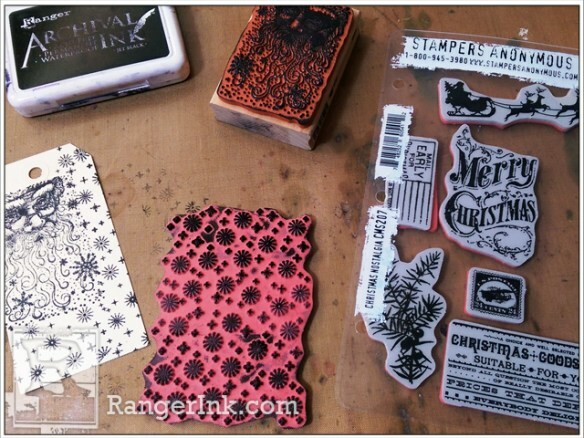 Ink the edges of the tag with Pumice Stone Distress Ink. Step 3: Color in the face with a Tattered Rose Distress Marker, and blend in a little Victorian Velvet on the cheeks. Color in the eyes with Mermaid Lagoon. Use a silver pen to color in the eye glasses, and a white pen for the whites of the eyes. Step 4: Cut blue or gray tone Core’dinations Nostalgic 12×12 Cardstock into 4 x 5 1/4 inch pieces…there are many tones to choose from. Emboss the pieces with the Sparkles Texture Fade using a die cut machine. Lightly sand over the raised snowflake sparkles with a Sanding Grip, revealing the Kraft Core. Remember to never sand on your Craft Sheet. Rub a Glacier White Ink Pad over the snowflake sparkles. 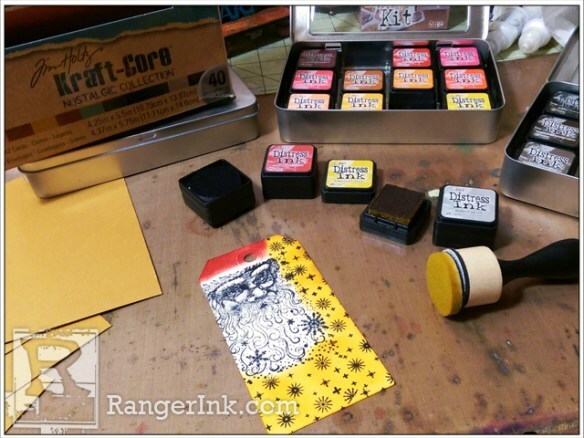 Ink the edges of the embossed card with Pumice Stone. Mount the tag onto this in the very left part, centering it there, and leaving a small gap on the left side, using the Adhesive Strips. Step 5: Use White Opal Liquid Pearls to paint in the white portions of the hat, the eyebrows, and the beard. Use Twilight Stickles to paint in the eyes. Let dry. Step 6: Ink the Flashcards (red word side) with Old Paper Distress Ink, and even use your finger to rub it around the edges well. Ink the sides with Pumice Stone. Use Adhesive Strips or Glossy Accents to adhere this onto the tag/embossed card, leaving a small gap on the right side and 1/8 inch from the bottom. Apply the Yuletide number chart looking Tissue Tape to the bottom edge of this, all the way across, and adhere any leftover onto the back of the card…it will not be seen. 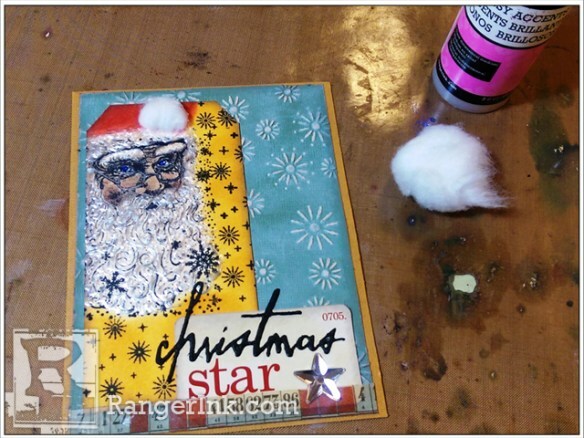 Adhere this tag/embossed card to the Core’dinations card base that coordinates with the ink around the Santa face, using Adhesive Strips. Step 7: Apply Adhesive Sheets to the back of Black Surfaces Cardstock. Die cut this with the Handwritten Holidays word of your choice that pairs well with the Flashcard, using a Magnetic Platform to make it easier to die cut (Run it through a few times to make sure it’s all cut well.). 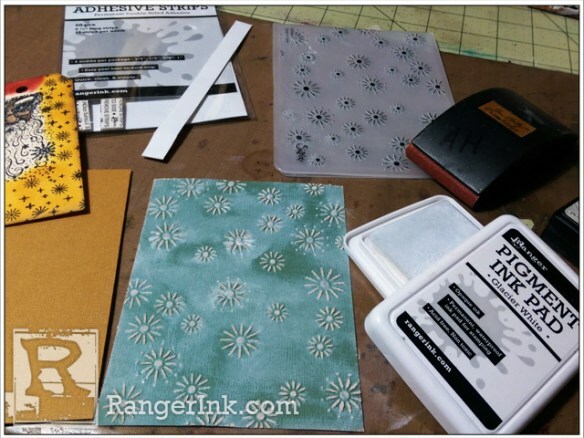 Use a Craft Pick to get all the tiny parts out of the die cut. Remove the backing paper from word and stick it onto the Flashcard. 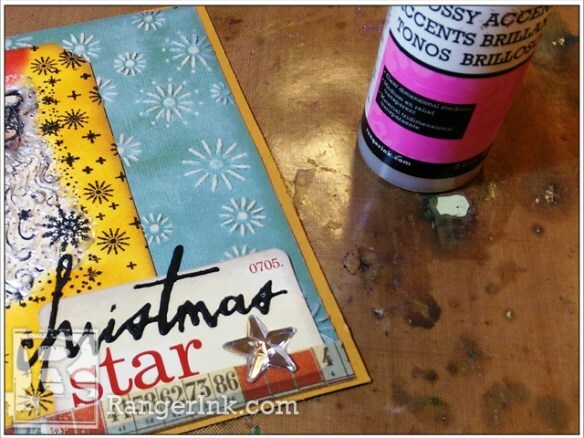 Step 8: Adhere a Mirrored Star onto the Flashcard where there is space or next to it using Glossy Accents. Step 9: Tear a small piece of cotton ball and shape it into a circle. Adhere it onto the tag hole with Glossy Accents so that it looks like it’s the white fuzzy ball on Santa’s hat that’s folded in. 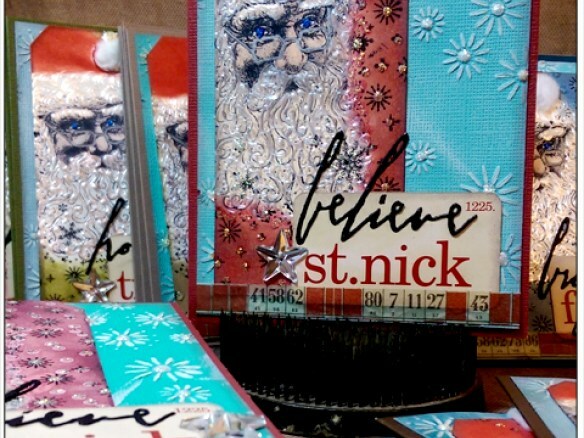 Step 10: Add Sprinkled Sugar or Clear Rock Candy Stickles to the Sparkle centers on the embossed card, and on the tag around all the wording. Let dry. My name is Anita Houston, aka, The Artful Maven, and I have been crafting ever since Jr. High School along with my mother. Touching, manipulating, and creating pieces to make something wonderful makes me happy! 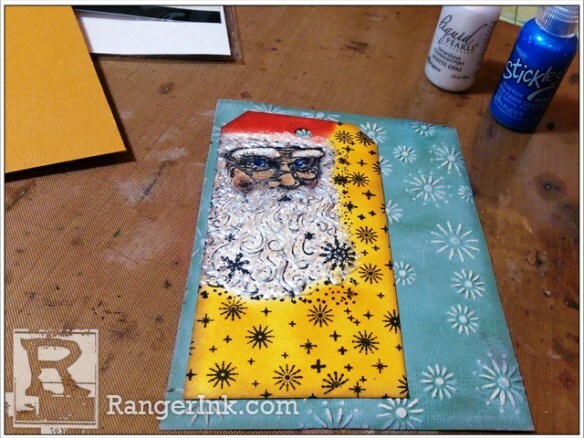 I love everything paper, paint, wax, metal, wood, and all things Ranger. 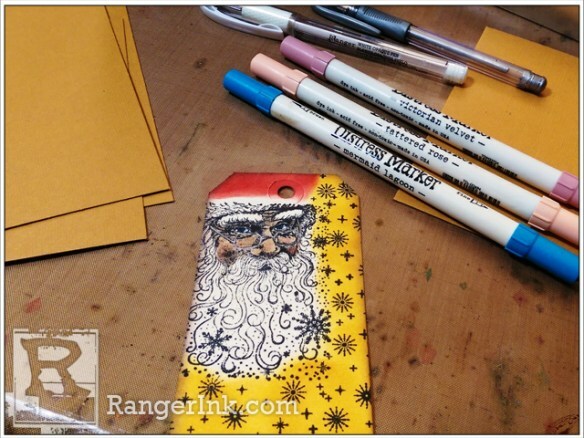 I was fortunate to be selected to go to Ranger U in 2012, and have been teaching and designing Mixed Media Art ever since. You can see my work on my website at : http://theartfulmaven.blogspot.com/.